It’s November already, and the cold weather signals the time for fall clean-up. Raking leaves and trimming the garden foliage involves a lot of yard waste. Only a leading provider of trash removal in Minneapolis helps you in cleaning out the unwanted yard waste while posing a positive impact on our natural living environment. Here is a checklist for your yard waste removal. In the fall and the winter, yard waste pickup timing varies drastically depending on the weather conditions and the amount of wastes to be removed. So, ensure that you have left your yard waste at the curb by early morning on the collection day. Avoid placing your yard waste out of your home in advance of your collection day. Leaving your bags at the curb prior to the collection day makes your bag wet by the changing weather conditions. The bags start to weaken and tear during the collection creating a mess at the curb. 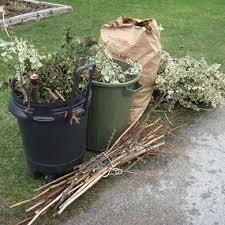 Leaving yard waste in rigid containers out for days fill up with water and become too heavy for collection. Leaves, brush, grass clippings, bales of straw, branches, tree trimmings, plant remains and Christmas trees should be the only items that remains into your yard trash removal bins. Place pumpkins and other fruit wastes in organic bins for collection. Segregate yard waste materials from your regular garbage to make it easy for pick-up. Containers for yard waste removal – Garbage can, rigid containers with handles, bushel baskets, burlap bags, yard waste bags, paper leaf, and corrugated cardboard boxes. Don’t put yard wastes in green bins, recycling boxes or other plastic bags. Remove lids and keep the garbage cans for yard waste open so that the waste collector can see the contents in the box. Don’t place wastes more than 20 kgs or 45lbs. Tie clippings from trees and shrubs securely in small bundles for easy handling. The bundles must be within 1 meter in length and 0.3 meters in diameter. Most rubbish removal service providers has no restriction on the number of bags a household can put out for junk pickup in MN. Grass clippings consist of valuable nutrients that can meet up to 25 percent of your lawn’s total fertilizer needs. So, reuse grass clippings in the yard to keep your grass healthy and saves space in the landfill. Compost made from leaves, weeds, prunings, dead flowers and ash from burnt wood provide important nutrients for soil and plants. Avoid burning yard wastes since the spores send aloft causes breathing problems in many sensitive individuals. ← Do You Donate Items?